Premixed and perfect for use in just about any humidifier in any humidor, this solution provides a practically effortless 70% humidity level every time. Convenient, simple, pure—and a must-have for anyone with a home cigar-storage system. Also available as Madelaine Propylene Glycol (4 Fl. oz. 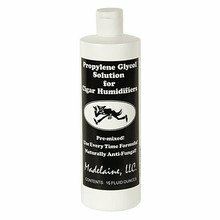 ),Madelaine Propylene Glycol (8 Fl. oz. ),Paradigm 16oz,Paradigm 8oz. I recharged a "new" humidifier with some of this solution, and it brought the humidity up to par. Easier than most other methods, and no, it won't drip if stuck to the top of the humidor. The only product to use in your Humidor. Anything else is just a waist of your time and money. This is the best. Very good, works as advertised. Keeps humidity to exacatly 70 % . I have been using many other products for years till I switched to Madelaine. This is the only product that I found that will keep your Stogies and your Humidor fresh and maintain the proper humidity. This is a no brainer. This seems to work as it should so far.